A bond is similar to a home mortgage. It is a contract to repay borrowed money with an interest rate over time. Bonds are sold by a school district to competing lenders to raise funds to pay for the costs of construction, renovations and equipment. 2. WHY DO SCHOOL DISTRICTS NEED TO SELL BONDS? Most school districts in Texas utilize bonds to finance renovations and new facilities. This bond would allow the district to finance improvements and new schools without needing to cut regular budget items like school programs, teachers and staff. Since school buildings sometimes serve the community for 50 or more years, it is well reasoned that taxpayers would pay for them over a period of 25 to 30 years and not from the district's annual operating budget. Bond funds can be used to pay for new buildings, additions and renovations to existing facilities, land acquisition, technology infrastructure and equipment for new or existing buildings and large-ticket items such as school buses. Bonds cannot be used for salaries or operating costs such as utility bills, supplies, building maintenance, fuel and insurance. 4. WHAT IS A BOND ELECTION? School districts are required by state law to ask voters for permission to sell bonds to investors in order to raise the capital dollars required to renovate existing buildings or build a new school. Essentially, it’s permission to take out a loan to build, renovate and pay that loan back over an extended period of time, much like a family takes out a mortgage loan for their home. A school board calls a bond election so voters can decide whether or not they want to pay for proposed facility projects. 5. EXACTLY HOW MUCH IS THE DISTRICT ASKING FOR IN THIS BOND ELECTION? The Board of Trustees called a bond election in the amount of $115 million to be brought before voters on November 7, 2017. 6. HOW WAS THE BOND PACKAGE DEVELOPED? Working with Board of Trustees, teachers and administrators from across the district, the long range facilities planning committee developed a list of requested items to consider for inclusion in a 2017 bond package. Community ISD has been evaluating current facilities and equipment, ongoing enrollment growth and district priorities with the Board of Trustees. 7. WHAT IS THE LONG-RANGE FACILITIES PLANNING COMMITTEE? The Community ISD Long-Range Facilities Planning Committee was formed in April 2017 and met three times over six weeks in April and May of 2017. 8. IS COMMUNITY ISD GROWING? Edge Middle School will enroll more than 530 students by 2018 and more than 600 students by 2020. Community High School will exceed campus capacity by 2020. Community ISD had nearly 500 home sales in 2016, and more than a third were new homes. This District median new home price is roughly $215,000. In the 4th quarter of 2016, Community ISD has 108 new home starts, more than triple the number of starts in the pervious 4th quarter. The District could close more than 220 new homes in 2017. Community ISD added 168 students in the fall of 2016. Community ISD can expect an increase of 930 students during the next 5 years. The projected enrollment for the 2021-2022 school yes is 3,019 students. Community ISD is projected to enroll 4,175 students for the 2026-2027 school year. 9. HOW IS THE DISTRICT'S TAX RATE CONFIGURED? A school district’s tax rate is comprised of two components: the Maintenance & Operations tax (M&O) and the Interest & Sinking tax (I&S). The M&O rate is used to operate the school district, including salaries, utilities, furniture, supplies, food, gas, etc. The I&S rate is used to pay off school construction bonds. Bond sales only affect the I&S rate. The tax rate is projected to increase from $1.62 to $1.67 (increase of 4.5 cents). 10. HOW WILL THIS IMPACT TAXES? 11. WILL THE CURRENT BONDS BE REFINANCED OR PAID DOWN BEFORE THE NEW BOND IS FUNDED? The District annually investigates opportunities for bond refunding (refinancing) and over the last 10 years has refunded (refinanced) several bond series saving over $13 million from our total debt service. 12. IF OUR GROWTH/TAX BASE DOES NOT MEET EXPECTATIONS, HOW WILL THE BOND AND SUBSEQUENT TAX INCREASE BE STRUCTURED? The bond program includes three phases over 10 years. The initial phase of the bond is approximately $62 million and includes reimbursement for school site land purchased by the District, construction of a new high school and renovation of the current high school to become the middle school campus. Our current tax base and enrollment will support this initial $62 million phase of the bond. Subsequent bonds for the other phases can not be issued unless the District continues to meet enrollment and tax base growth as predicted. Therefore, there will will not be a need to restructure any bonds (other than for interest rate savings) because legally we would not be able to issue additional bonds if our tax base and student enrollment does not grow as predicted. 13. IS THERE ANY CONCERN ABOUT OVERCROWDING THE SMALL COUNTRY ROADS SURROUNDING ALL THE NEW CONSTRUCTION? If voters approve the bond on November 7th, traffic flow and road access at current and future school sites will be addressed during the design phase. 14. HOW AS A TAXPAYER CAN I HOLD THOSE IN CHARGE OF SPENDING MY MONEY ACCOUNTABLE? If voters approve the Bond on November 7th, the District has committed to hosting regular bond progress meetings which will be open to the public. At these meetings, all financial documents related to bond projects will be shared and project updates, including timelines, will be presented. These documents and updates will also be published on the district website. 15. WHO ULTIMATELY IS RESPONSIBLE FOR SEEING THAT THE MONEY IS SPENT WISELY? We are all responsible for the betterment and success of our school system. Community ISD is committed to providing opportunities for stakeholders to provide input and participate in the decision making process. Ultimately, our elected board of trustees holds the superintendent accountable to ensure successful oversight of the entire District. 16. WHAT IS THE PLAN IF THE BOND FAILS? If voters do not approve the bond on November 7, the District will purchase portable buildings for additional classrooms to alleviate overcrowding. 17. WHAT WILL HAPPEN TO THE CURRENT MIDDLE SCHOOL ONCE THE HIGH SCHOOL CAMPUS IS RENOVATED INTO THE NEW MIDDLE SCHOOL? If the bond is approved, once the current high school has been renovated to become the middle school campus, as tax base and growth allows the existing middle school will be renovated and repurposed based on the needs of the district at that time. 18. WHY WAS THE LAND PURCHASED BEFORE THE BOND WAS APPROVED? The 80 acres immediately to the south of the football stadium and athletic parking lot was purchased by CISD in June 2017. The CISD Board of Trustees gave the Superintendent permission to approach the previous land owners about purchasing the property after financial analysis of potential bond scenarios revealed that the District would qualify for approximately $62 million for the first phase of a bond program. The cost to build an entire new high school including athletic facilities (i.e. football field, baseball and softball fields) in a different location would be more than double $62 million. In order for our students to continue to utilize the existing athletic facilities located on the current high school campus, it became necessary to purchase an adjacent piece of property. 19. WHAT HAPPENS TO THE LAND IF THE BOND DOES NOT PASS? If the bond does not pass, the purchased land will still be available when the school is ready to be built. As CISD continues to grow, the district will continue to review facilities & land opportunities for future school sites. 20. WHO DECIDES TO PURCHASE THE LAND BEFORE A BOND WAS EVEN DISCUSSED? 20. WHEN WAS THE LAND PURCHASED? DID WE GO THROUGH AN ATTORNEY OR REALTOR? The land was purchased in June 2017. CISD’s attorneys oversaw the transaction. 21. DID WE HAVE MONEY SET ASIDE FOR FUTURE GROWTH IN PREVIOUS BUDGETS OR DID THE DISTRICT PULL THE MONEY FROM OUR GENERAL ACCOUNT? The fund balance in the general account was used to purchase the land. 22. DID ANYONE MEET WITH DEVELOPERS AND TRY TO MAKE SOME TYPE OF DEAL? IN MOST SCHOOL DISTRICTS (DO) THE DEVELOPERS WORK VERY CLOSE WITH THE SCHOOLS AND "DONATE" LAND FOR SCHOOLS TO BE BUILT? Regarding the purchased land, while speaking to the family that owned the property, Dr. Nivens did ask if they would be willing to donate the land. That offer was declined. Dr. Nivens has met with one developer about land for a future school site, however they were not interested in donating it. Dr. Nivens will have future meetings to speak with interested developers about land donations. There are instances where developers in fast-growth areas have donated a parcel of land to a school district for future school sites. CISD has not been offered any donated land. 23. DID WE GET BIDS (MAY BE A BETTER TERM) FROM MORE THAN ONE FIRM? WHO MADE THE FINAL DECISION TO GO WITH THE FIRM WE CHOSE? The district released a “Request for Qualifications” (RFQ) for architectural services in December 2016. Multiple companies submitted bids before the January 26, 2017 deadline. Upon receipt, the proposals were reviewed, evaluated, and interviewed by a committee. The committee chose WRA to provide services for phase one of the bond referendum. The district released an “Request for Proposal” (RFP) for “Construction Manager at Risk” (CMR) services in September 2017. The bid period closed on October 26, 2017. Twelve companies submitted proposals before the October 26, 2017 deadline. Just as we did for the architect, the RFQ committee will review, evaluate, and interview firms. A recommendation will go to the board soon thereafter. 24. WHAT HAPPENS IF THE BOND DOES NOT PASS? 25. HOW DO WE INTEND TO PAY THE MONEY BACK TO THE DISTRICT? The money was used from the fund balance in the general account. Without it, we will have the necessary funds for any unforeseen issues. 26. IF WE SELL THE LAND FOR PROFIT IS THAT LEGAL AND IF SO WHERE DOES THE PROFITED MONEY GO TO? There are no plans to sell the land. If voters do not approve the bond the purchased land will still be available for future purposes. 27. WAS THERE EVER ANY LAND OFFERED TO BE DONATED BY INDIVIDUALS OR DEVELOPERS? IF SO, WHY DID WE CHOSE NOT TO GO WITH DONATED LAND? No, there was never an offer for the land to be donated by individuals or developers. HOW IS 727,000,000.00/100 X 4.5 CENTS= $327,150 ENOUGH TO PAY BACK 62,000,000? 62,000,000/327,150= 189 1/2 YEARS AND THAT IS WITH 0% INTEREST. 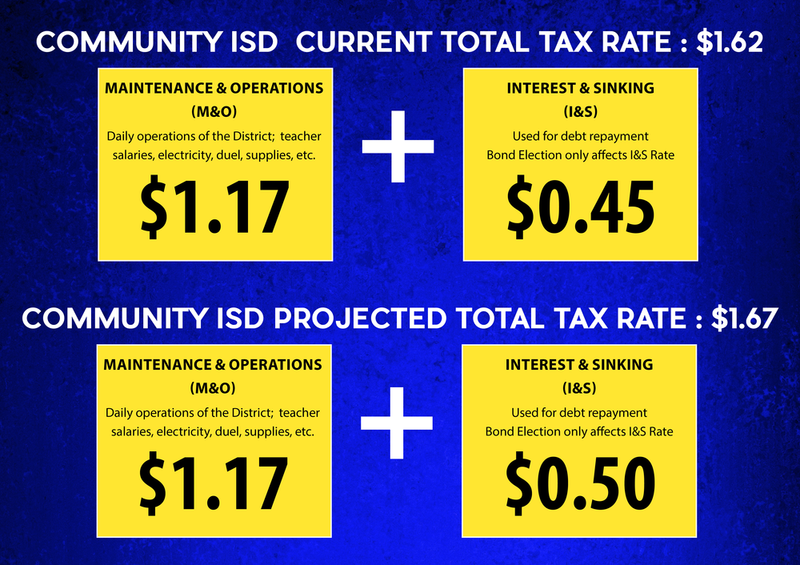 The chart below explains that CISD can afford the bond. We will be able to make all bond payments while placing money, roughly $50,000, in our I&S fund balance. This will not impact the M&O fund and therefore salaries will not be impacted. The district’s financial planners have put together a very conservative growth model which assumes our enrollment (ADA, Average Daily Attendance) will grow at 4% over the next six years (we have grown at an average of 13% over the last three years) and our taxable value will grow at 8%. In the chart below you can see how if voters approve the .045 cent tax increase the district will be able to afford the $62 million first phase of the bond program with money left over. 29. WHO PAID FOR THE MARKETING MATERIAL THAT ALL BOND PROMOTION MATERIAL WAS PRINTED? YARD SIGNS, HANDOUTS, MAILERS, POSTAGE ETC. By law the District can only pay for printed material that factually describe the purposes of the bond and can not legally pay for or distribute flyers, signs, banners, etc that advocate passage or defeat of the matter. Any material that advocates for or against the bond has been paid for by donations or contributions to a political action committee. 30. HOW MUCH DID WE PAY THE HIRED FIRM? WHAT WAS THE TOTAL COST WE PAID TO THEM? COULD THE MONEY THAT WAS USED TO PAY THE FIRM GO TOWARDS A TEACHERS SALARY? An Architectural firm (WRA Architects) was hired on February 21, 2017 after an RFQ (Request for Qualification) process. WRA Architects have not received any compensation for work on the bond proposal. If voters approve the bond, their fees will be paid out of bond funds. Bond funds cannot be used to pay teacher salaries. 31. DID ANYONE (PERSONAL, BUSINESS OR GOVERNMENT ENTITY) EVER OFFER TO GIVE ANY AMOUNT OF LAND TO CISD FOR FREE OR AT A VERY LARGE DISCOUNTED PRICE? No, this was never offered to CISD. 32. Why are we building a brand new high school that will add only 50 new classrooms. Current high school capacity is 750 and new high school capacity will be 800. McClendon hits capacity first. What will we do with those kids when it hits capacity? The planning committee, that contained 90 members from the community, wanted to address the two buildings that needed the most repair. This plan will address their priorities. As I said last night, we will have to have portables either way. The real question is how long will we be in those portables. if we continue to grow, we will renovate EMS and it will serve as another campus to ease crowding in schools. 33. What kind of renovations are you talking about on the old HS? Air Conditioner in gyms, technology, extracurricular classes added. The design phase will address those concerns. There will be a committee and if you would like to be part of that process and conversation, I encourage you to do so. 34. Why would we not build a new ag shop with the new facility? That is one of the most successful programs at our school. I agree; however, our tax base only supports 2 new facilities; a new high school and a new elementary school. All other facilities must be renovated. Our ag program is a pillar in our district and we want it to flourish. We will make certain it continues to grow. 35. You said there will be ag classrooms in response to someones question but on the presentation you said there would not be a new ag shop. Correct. There will be an ag classroom but no new shop. It will be renovated in phase 2. 36. How can we ensure there will be classrooms for for ag when that is extracurricular and not academic? The new school is for academic only correct? Ag is both. Ag is considered a CTE course in which students get academic credit with the State of Texas as well as they can earn certifications that will allow them to enter the workforce ready and prepared. Depending on how well they perform, students also earn scholarship money for college. We understand that not every child will go to a 4-year college or university so we need to help them be successful in their chosen career path. 37. The new school is for academic classes only. Do we have any idea the cost associated with adding extracurricular activities? Who will decide what programs we go with? Extracurricular activities are synonymous with sports in my opinion. The CTE programs are all geared towards college and career explorations for students (Ag, Culinary arts, welding, cosmetology, Forensic sciences, Cybersecurity, etc). However, there will be a committee to talk about CTE programming. And if you would like to be part of that process and conversation, I encourage you to do so. 38. If our goal is to give students more opportunities why are we building a school with only academic rooms and nothing that will allow for other programs? 39. You stated there would be no athletic facility built but there would be a gym built into the new school. Does this gym include locker rooms, offices and a court that will be used to host volleyball and basketball games or will the old gym be used to host games? Every high school in Texas has a gym with the necessary space for coaches and PE classes. This bond will not address the current athletic facility and/or stadium. 40. Will this new school take into consideration the size of our band and provide them with adequate facilities?